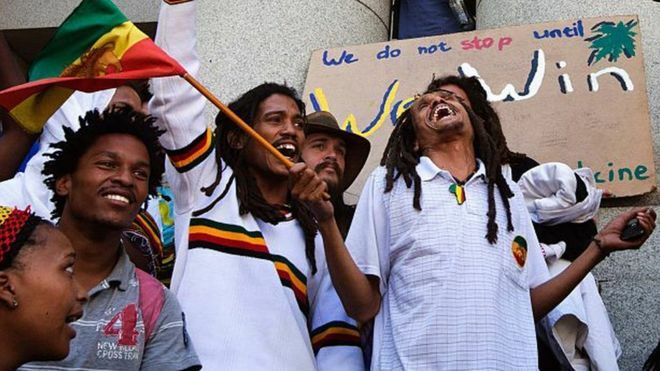 About 100 Rastafarians and other members of the public sing and dance outside the Cape Town High Court in support of a court application to decriminalise dagga (marijuana/cannabis) on December 7, 2015 in the Cape Town centre. South Africa's highest court has legalised the use of cannabis by adults in private places. Pro-marijuana activists cheered in the public gallery and chanted "Weed are free now" when the Constitutional Court gave its landmark ruling. 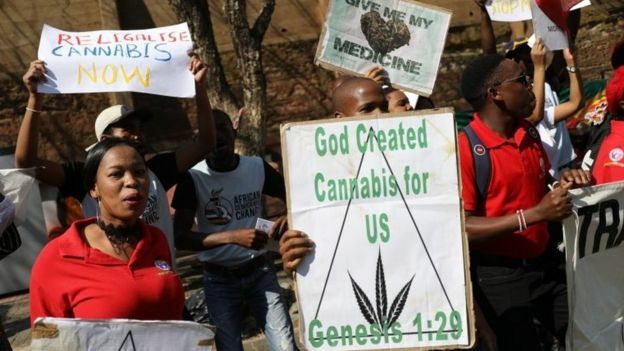 South Africa's government had opposed its legalisation, arguing the drug was "harmful" to people's health. Three cannabis users who had faced prosecution for using the drug brought the case, saying the ban "intrudes unjustifiably into their private spheres". In his judgement, Deputy Chief Justice Raymond Zondo said: "It will not be a criminal offence for an adult person to use or be in possession of cannabis in private for his or her personal consumption." Jeremy Acton, the leader of the Dagga Party, which campaigns for the use of cannabis, said the ruling should have gone further to legalise the carrying of marijuana in public. Cannabis is referred to as "dagga" in South Africa. This judgement is a reminder that South Africa's hard-won constitution is among the most liberal in the world, backing individual rights, and in this case the right to grow and smoke your own marijuana in private, against the government's concerns about public health and public order. The Constitutional Court's ruling focuses on the issue of privacy, and a person's right to do as they please in their own home. The potential implications of the binding judgment are enormous, and unpredictable - particularly in terms of the criminal justice system, which routinely locks up thousands of overwhelmingly poor South Africans for using or dealing in small amounts of cannabis. It is possible that the ruling, by allowing users to grow their own marijuana at home, could undermine the stranglehold of powerful drug gangs that blight so many communities. But the police, who argued against this change, will worry that the ruling will create more ambiguity and send the wrong signal to criminals. The court has not approved - in any form - the trade in marijuana, meaning the government will not be able to profit from taxing a legalised industry. In political terms, the landmark ruling emphasises the primacy of South Africa's constitution, which brushed aside the united opposition of numerous government ministries at a time when the authority and credibility of many of this young democracy's other institutions have been eroded by corruption and poor governance. The court gave parliament 24 months to change the law to reflect its ruling. Adults who used marijuana in private would be protected by the ruling until the law was amended. The court did not specify the quantity of cannabis a person can grow or use in private. Parliament would have to decide on this, it said. The home of Zef just rang up all the prohibitionist retards and said “Fok Julle naaiers!”…. Awesome news! It’s beyond mind-boggling that things are actually moving the other direction here in Denmark (and sadly also a few other places) with respect to private (recreational) consumption! Ho$h pagamisa! raak fokken wys! Always know where your towel is! The highest courts make the best decisions. Mate out there says it's $200 a kilo. SOOO COOL!!! Would love to smoke up in CAPETOWN! !